The unbiased Consumer Reports survey reveals that Tesla Model 3 owners are the most satisfied and passionate lot when it comes to their car. Consumer Reports rates customer satisfaction based on driving experience, comfort, value for money, styling and if the owner is willing to buy the car if given the option — Tesla Model 3 tops the chart all of these combined. The average price for new cars continues to rise; it’s about $35,000 now, according to the National Automobile Dealers Association. For that much money, you’d think happiness would be part of the deal, but it’s not. Consumer Reports members shared the experiences they’ve had with more than 500,000 vehicles in our 2018 auto surveys. Primarily, they were asked whether they would buy the same car again. That decision is the basis of CR’s owner satisfaction score. We looked at this year’s data to see how owners rate their cars on satisfaction in five categories: driving experience, comfort, value, styling, and audio controls. These factors show where a car shines and where it comes up short. The survey results show that in every vehicle type, there’s a significant spread between the models that met expectations and those that were disappointing. Before buying, learn from others’ experiences by using the detailed ratings available on the car model pages, where you will also find reliability, road tests, and pricing information. 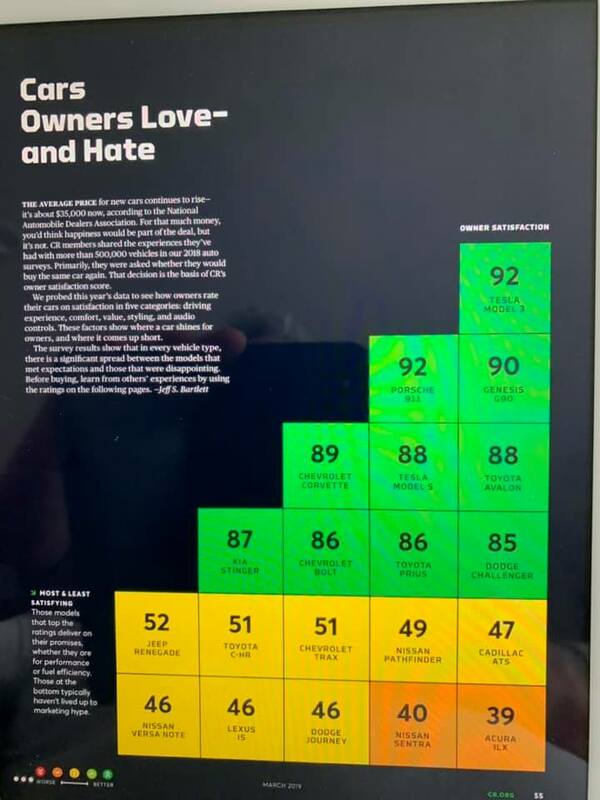 The print magazine of Consumer Reports showcases a comparison chart where Tesla Model 3 stays on top with 92 points in overall customer satisfaction. Two more electric cars have made to the green segment of the graph (most satisfied customers), Tesla Model S taking the 5th position (88 points) and Chevrolet Bolt holding the 8th position with 86 points. Tesla Model 3 has been scoring aces in various tests and reviews, be it a 5-star safety rating from NHTSA or 0-60 mph record breaking. The stories and pictures owners share on social media from time to time also give us an idea of how much they love their car. Last year Consumer Reports dropped Tesla Model 3 from their recommendation index due to the longe braking distance of the car against the competition — but Tesla was able to rectify the issue within a week with an over-the-air software update. Tesla owners are also one of the most engaged users of their cars as they experience improvements to their vehicles with software updates and even in-car entertainment is on another level with TeslAtari video games that also get updates and new games time to time. We can see the glimpse of Tesla Model 3 love in the following Twitter post from a happy couple that owns the car for a while now and thousands other owners and enthusiasts have liked/shared their passion.